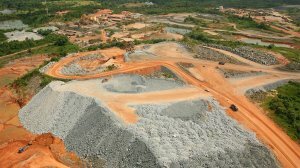 JOHANNESBURG (miningweekly.com) – Gold Fields will invest $1.4-billion to extend the life of its Damang mine, in Ghana, from 2017 to 2024. Over the life of the mine, 165-million tons will be mined, with 32-million tons processed at a grade of 1.65 g/t, resulting in total gold production of 1.56-million ounces. Damang is expected to produce, on average, about 225 000 oz/y of gold. Gold Fields West Africa head Alfred Baku highlighted that in the first two years of the project, Damang would be operating at a loss, owing to the capital expenditure required for the expansion. The mine’s financial position would, however, improve from 2019. Mining and processing costs are estimated to average $3.60/t and $16.25/t, respectively, while all-in costs (AIC) are forecast to average $950/oz. The $1.4-billion reinvestment plan for the mine is based on mineral resource models that were updated earlier this year and extensively reviewed both internally and by external consultants, SRK Consulting, Optiro and Rowley Geological Services. Baku highlighted that since operations at Damang commenced in 1997, the openpit mine has produced over four-million ounces of gold, predominantly from the main Damang Pit Cutback (DPCB). Production was halted at DPCB in 2013, with the focus shifted to smaller pits, namely the Huni, Juno and Saddle pits, as well as lower-grade satellite deposits. The subsequent decline in production at Damang since 2013 had been further exacerbated by varying gold grades in the northern and southern extremities of the DPCB and low-grade satellite pits. Consequently, a strategic review of Damang was undertaken in 2015, which determined that Gold Fields should refocus its efforts on the higher-grade deposits found in the main Damang orebody. Gold Fields considered placing Damang under care and maintenance; however, the high cost of paying workers for redundancy and the risk of exposing the mine to illegal miners made that plan infeasible. Given the importance of the West African region to Gold Fields and taking into account the benefits of the development agreement, the company decided to continue operations at Damang through the reinvestment plan. Gold Fields will also retain the optionality to expand the operation should the gold price strengthen sustainably to above $1 400/oz. The reinvestment plan entails a major cutback to both the eastern and western walls of the DPCB. The cutback will have a total depth of 341 m, comprising a 265 m prestrip to access the base of the existing pit. This will be followed by a deepening of the pit by a further 76 m, which will provide access to the full Damang orebody, including the high-grade Tarkwa Phyllite lithology. To provide short-term ore supply, while prestrip operations are in progress, mining will continue at the Amoanda, and paleaoplacer satellite pits, namely Lima South, Kwesi Gap and Tomento East. In addition, the plant feed will be supplemented by low-grade surface stockpiles. Inclusion of the Damang cutback will result in a 72% increase in proven and probable reserves to 1.68-million ounces. Mining will be undertaken by two mining contractors, with negotiations currently at an advanced stage. Baku highlighted that the contractors would work in the north and south pits respectively, which would aid in spreading production risks at the mine. He pointed out that the agreements would also contain penalty and bonus clauses, which would come into effect if the contractors failed or exceeded production targets. Further, Baku highlighted that the decision to use mining contractors significantly improved the financial feasibility of the project, particularly since part of the agreement would be to buy equipment from Gold Fields to the tune of about $25-million. At this stage, the contractors are expected to be mobilised early next year. The reinvestment will also include the construction of the Far East Tailings Storage Facility (FETSF), as the existing TSF is approaching full capacity. An interim 2.5 m raise has started on the current TSF, which will provide for an additional 3.6-million tons of tailings capacity and is due for completion by the end of this month. Stage 1 of the new FETSF is planned for completion by the end of next year and will provide 20-million tons of capacity. Further lifts of the FETSF will cater for all tailings for the new life-of-mine. Only minor capital work will be required on the Damang processing plant, which will mainly entail replacing the semi-autogenous grinding mill shell in 2018.